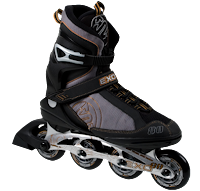 We designed the Exo 80 for the intermediate skater who wants once a skate that is comfortable, breathable, supportive and responsive. We have outfitted the Alu with an 80mm wheel, ABEC 5 bearings and our new Diecast Aluminum frame. If you are a value orientated skater who wants solid performance this is the skate for you.